You can instantly download the ebook version of Book Proposals That Sell, 21 Secrets To Speed Your Success. This book is available in many different places. As Senior Editor at Multnomah Publishers Larry Libby says, "In the often bewildering world of book publishing, aspiring authors need more than desire, creative skill, and something worthwhile to say. They also need a road map. My friend Terry Whalin offers a map even Rand-McNally couldn’t top. If you have any inclination toward getting a book published, you’ll do well by studying this book first." Through this link, you can learn what editors, literary agents and best-selling authors are saying about the book. Terry Whalin has purchased the remaining print copies of this book and you can get it directly from him at: http://www.bookproposalsthatsell.com. This book has over 130 Five Star Amazon reviews but don't get it from Amazon. Instead get it directly from the author at: http://www.bookproposalsthatsell.com. 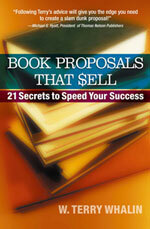 Or you can order the downloadable ebook and over $700 of bonuses immediately at: http://www.bookproposals.ws.